Spoken in: Commonwealth of Independent States, Poland, Uruguay, Czech Republic, Slovakia, Israel, Japan, India, China, Baltic States, Romania. Countries of the world where Russian is spoken. Russian (русский язык (help), transliteration: russkiy yazyk) is the most geographically widespread language of Eurasia, the most widely spoken of the Slavic languages, and the largest native language in Europe. Russian is a Slavic language in the Indo-European family. From the point of view of the spoken language, its closest relatives are Ukrainian and Belarusian, the other two national languages in the East Slavic group. In many places in eastern Ukraine and Belarus, these languages are spoken interchangeably, and in certain areas traditional bilingualism resulted in language mixture, e.g., Surzhyk in eastern Ukraine and Trasianka in Belarus. An East Slavic Old Novgorod dialect, although vanished during the fifteenth or sixteenth century, is sometimes considered to have played a significant role in formation of the modern Russian language. It is also spoken by the countries of the Russophone. 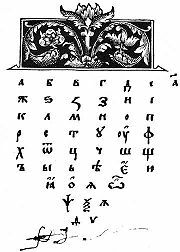 Written examples of Old East Slavonic are attested from the tenth century onwards. Today Russian is widely used outside Russia. Over a quarter of the world's scientific literature is published in Russian. It is also applied as a means of coding and storage of universal knowledge–60–70 percent of all world information is published in English and Russian languages. Russian is a necessary accessory of world communications systems (broadcasts, air- and space communication, etc). Russian is one of the official languages of the United Nations, due largely to the status of the Soviet Union as a superpower and member of the Allied powers during World War II. Russian had great political importance in the twentieth century. The vocabulary (mainly abstract and literary words), principles of word formation, and, to some extent, inflections and literary style of Russian have been also influenced by Church Slavonic, a developed and partly adopted form of the South Slavic Old Church Slavonic language used by the Russian Orthodox Church. However, the East Slavic forms have tended to be used exclusively in the various dialects that are experiencing a rapid decline. In some cases, both the East Slavic and the Church Slavonic forms are in use, with slightly different meanings. For details, see Russian phonology and History of the Russian language. Russian phonology and syntax (especially in northern dialects) have also been influenced to some extent by the numerous Finnic languages of the Finno-Ugric subfamily: Merya, Moksha, Muromian, the language of the Meshchera, Veps, et cetera. These languages, some of them now extinct, used to be spoken in the center and in the north of what is now the European part of Russia. They came in contact with Eastern Slavic as far back as the early Middle Ages and eventually served as substratum for the modern Russian language. The Russian dialects spoken north, north-east and north-west of Moscow have a considerable number of words of Finno-Ugric origin. Over the course of centuries, the vocabulary and literary style of Russian have also been influenced by Turkic/Caucasian/Central Asian languages, as well as Western/Central European languages such as Polish, Latin, Dutch, German, French, and English. According to the Defense Language Institute in Monterey, California, Russian is classified as a level III language in terms of learning difficulty for native English speakers, requiring approximately 780 hours of immersion instruction to achieve intermediate fluency. It is also regarded by the United States Intelligence Community as a "hard target" language, due to both its difficulty to master for English speakers as well as due to its critical role in American world policy. Russian is primarily spoken in Russia and, to a lesser extent, the other countries that were once constituent republics of the USSR. Until 1917, it was the sole official language of the Russian Empire, although during the nineteenth century the language spoken in literary circles by the aristocracy in Saint Petersburg was largely French. During the Soviet period, the policy toward the languages of the various other ethnic groups fluctuated in practice. Though each of the constituent republics had its own official language, the official language of government and communications was reserved for Russian. Following the break-up of the Soviet Union in 1991, several of the newly independent states have encouraged their native languages, which has partly reversed the privileged status of Russian, though its role as the language of post-Soviet interstate communication throughout the region has continued. In Latvia, notably, its official recognition and legality in the classroom have been a topic of considerable debate in a country where more than one-third of the population is Russian-speaking, consisting mostly of post-World War II immigrants from Russia and other parts of the former USSR (Belarus, Ukraine). Similarly, in Estonia, the Soviet-era immigrants and their Russian-speaking descendants constitute 25.6 percent of the country's current population and 58.6 percent of the native Estonian population is also able to speak Russian. In all, 67.8 percent of Estonia's population can speak Russian. In Kazakhstan and Kyrgyzstan, Russian remains a co-official language with Kazakh and Kyrgyz respectively. Large Russian-speaking communities still exist in northern Kazakhstan, and ethnic Russians comprise 25.6 percent of Kazakhstan's population. A much smaller Russian-speaking minority in Lithuania has largely been assimilated during the decade of independence and currently represent less than one tenth of the country's overall population. Nevertheless more than half of the population of the Baltic States are able to hold a conversation in Russian and almost all have at least some familiarity with the most basic spoken and written phrases. The Russian control of Finland in 1809–1918, however, has left few Russian speakers in Finland. There are 33,400 Russian speakers in Finland, amounting to 0.6 percent of the population. Five thousand (0.1 percent) of them are late nineteenth century and twentieth century immigrants, and the rest are recent immigrants, who arrived in the wake of the Soviet collapse. 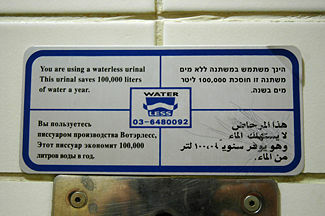 Sign above a urinal in an Israeli international airport. Translated into four languages spoken in Israel: English, Hebrew, Russian, and Arabic. In the twentieth century, Russian was widely taught in the schools of the member states of the old Warsaw Pact and in other countries that were allied, voluntarily or involuntarily with the USSR. These countries include Poland, Bulgaria, the Czech Republic, Slovakia, Hungary, Romania, Albania and Cuba. However, younger generations are usually not fluent in it because Russian is no longer mandatory in the school system. It was, and to a lesser extent still is, taught in Mongolia due to Soviet influence. Russian is also spoken in Israel by at least 750,000 ethnic Jewish immigrants from the former Soviet Union (1999 census). The Israeli press and websites regularly publish material in Russian. Sizable Russian-speaking communities also exist in North America, especially in large urban centers of the U.S. and Canada such as New York City, Philadelphia, Boston, Los Angeles, San Francisco, Seattle, Toronto, Baltimore, Miami, Chicago, Denver, and the Cleveland suburb of Richmond Heights. In a number of locations they publish their own newspapers, and live in self-sufficient neighborhoods (especially the generation of immigrants who started arriving in the early 1960s). Only about a quarter of them are ethnic Russians, however. Before the dissolution of the Soviet Union, the overwhelming majority of Russophones in North America were Russian-speaking Jews. Afterwards the influx from the countries of the former Soviet Union changed the statistics somewhat. According to the United States 2000 Census, Russian is the primary language spoken in the homes of over 700,000 individuals living in the United States. Significant Russian-speaking groups also exist in Western Europe. These have been fed by several waves of immigrants since the beginning of the twentieth century, each with its own flavor of language. Germany, the United Kingdom, Spain, France, Italy, Belgium, Greece, Brazil, Norway, Austria, and Turkey have significant Russian-speaking communities totaling about three million people. Two thirds of them are actually Russian-speaking descendants of Germans, Greeks, Jews, Armenians, or Ukrainians who either repatriated after the USSR collapsed or are just looking for temporary employment. Earlier descendants of the Russian émigrés tended to lose the tongue of their ancestors by the third generation. Now, because the border is more open, Russian might survive longer, especially because many of the emigrants visit their homelands at least once a year and also have access to Russian websites and TV channels. Russian-language schooling is also available in Latvia, Estonia and Lithuania, but due to education reforms in those countries, at a reduced level. The language has a co-official status alongside Romanian in the autonomies of Gagauzia and Transnistria in Moldova, and in seven Romanian communes in Tulcea and Constanţa counties. In these localities, Russian-speaking Lipovans, who are a recognized ethnic minority, make up more than 20 percent of the population. Thus, according to Romania's minority rights law, education, signage, and access to public administration and the justice system are provided in Russian alongside Romanian. In the Autonomous Republic of Crimea in Ukraine, Russian is an officially recognized language alongside with Crimean Tatar, but in reality, is the only language used by the government, serving as a de facto official language. Despite leveling after 1900, especially in matters of vocabulary, a number of dialects still exist in Russia. 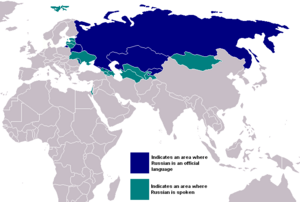 Some linguists divide the dialects of the Russian language into two primary regional groupings, "Northern" and "Southern," with Moscow lying on the zone of transition between the two. Others divide the language into three groupings, Northern, Central and Southern, with Moscow lying in the Central region. Dialectology within Russia recognizes dozens of smaller-scale variants. The dialects often show distinct and non-standard features of pronunciation and intonation, vocabulary, and grammar. Some of these are relics of ancient usage now completely discarded by the standard language. The northern Russian dialects and those spoken along the Volga River typically pronounce unstressed /o/ clearly (the phenomenon called okanye/оканье). East of Moscow, particularly in Ryazan Region, unstressed /e/ and /a/ following palatalized consonants and preceding a stressed syllable are not reduced to [ɪ] (like in the Moscow dialect), being instead pronounced as /a/ in such positions (e.g. несли is pronounced as [nʲasˈlʲi], not as [nʲɪsˈlʲi]) - this is called yakanye/ яканье. However, in certain areas south of Moscow, e.g. in and around Tula, /g/ is pronounced as in the Moscow and northern dialects unless it precedes a voiceless plosive or a pause. In this position /g/ is lenited and devoiced to the fricative [x], e.g., друг [drux] (in Moscow's dialect, only Бог [box], лёгкий [lʲɵxʲkʲɪj], мягкий [ˈmʲæxʲkʲɪj] and some derivatives follow this rule). Some of these features (e.g., a debuccalized or lenited /g/ and palatalized final /tʲ/ in 3rd person forms of verbs) are also present in modern Ukrainian, indicating either a linguistic continuum or strong influence one way or the other. The city of Veliky Novgorod has historically displayed a feature called chokanye/tsokanye (чоканье/цоканье), where /ʨ/ and /ʦ/ were confused (this is thought to be due to influence from Finnish, which doesn't distinguish these sounds). So, цапля ("heron") has been recorded as 'чапля'. Also, the second palatalization of velars did not occur there, so the so-called ě² (from the Proto-Slavonic diphthong *ai) did not cause /k, g, x/ to shift to /ʦ, ʣ, s/; therefore where Standard Russian has цепь ("chain"), the form кепь [kʲepʲ] is attested in earlier texts. Among the first to study Russian dialects was Lomonosov in the eighteenth century. In the nineteenth, Vladimir Dal compiled the first dictionary that included dialectal vocabulary. Detailed mapping of Russian dialects began at the turn of the twentieth century. In modern times, the monumental Dialectological Atlas of the Russian Language (Диалектологический атлас русского языка [dʲɪɐˌlʲɛktəlɐˈgʲiʨɪskʲɪj ˈatləs ˈruskəvə jɪzɨˈka]), was published in 3 folio volumes 1986–1989, after four decades of preparatory work. The standard language is based on (but not identical to) the Moscow dialect. Surzhyk is a language with Russian and Ukrainian features, spoken in some areas of Ukraine. Nadsat, the fictional language spoken in the futuristic novel A Clockwork Orange by Anthony Burgess, 1963, that describes moral dilemmas in authoritarian society, uses a lot of Russian words and Russian slang. A page from Azbuka (Alphabet book), the first Russian textbook. Printed by Ivan Fyodorov in 1574. This page features the Cyrillic alphabet. Older letters of the Russian alphabet include <ѣ>, which merged to <е> (/e/); <і> and <ѵ>, which both merged to <и>(/i/); <ѳ>, which merged to <ф> (/f/); and <ѧ>, which merged to <я> (/ja/ or /ʲa/). The yers <ъ> and <ь> originally indicated the pronunciation of ultra-short or reduced /ŭ/, /ĭ/. While these older letters have been abandoned at one time or another, they may be used in this and related articles. The Russian alphabet has many systems of character encoding. KOI8-R was designed by the government and was intended to serve as the standard encoding. This encoding is still used in UNIX-like operating systems. Nevertheless, the spread of MS-DOS and Microsoft Windows created chaos and ended by establishing different encodings as de facto standards. For communication purposes, a number of conversion applications were developed. \ "iconv" is an example that is supported by most versions of Linux, Macintosh and some other operating systems. Most implementations (especially old ones) of the character encoding for the Russian language are aimed at simultaneous use of English and Russian characters only and do not include support for any other language. Certain hopes for a unification of the character encoding for the Russian alphabet are related to the Unicode standard, specifically designed for peaceful coexistence of various languages, including even dead languages. Unicode also supports the letters of the Early Cyrillic alphabet, which have many similarities with the Greek alphabet. Russian spelling is reasonably phonemic in practice. It is in fact a balance among phonemics, morphology, etymology, and grammar; and, like that of most living languages, has its share of inconsistencies and controversial points. A number of rigid spelling rules introduced between the 1880s and 1910s have been responsible for the latter while trying to eliminate the former. The current spelling follows the major reform of 1918, and the final codification of 1956. An update proposed in the late 1990s has met a hostile reception, and has not been formally adopted. The punctuation, originally based on Byzantine Greek, was in the seventeenth and eighteenth centuries reformulated on the French and German models. The phonological system of Russian is inherited from Common Slavonic, but underwent considerable modification in the early historical period, before it was largely settled by about 1400. Clusters of four consonants are not very common, however, especially within a morpheme. Russian is notable for its distinction based on palatalization of most of the consonants. While /k/, /g/, /x/ do have palatalized allophones [kʲ, gʲ, xʲ], only /kʲ/ might be considered a phoneme, though it is marginal and generally not considered distinctive (the only native minimal pair which argues for /kʲ/ to be a separate phoneme is "это ткёт"/"этот кот"). Palatalization means that the center of the tongue is raised during and after the articulation of the consonant. In the case of /tʲ/ and /dʲ/, the tongue is raised enough to produce slight frication (affricate sounds). These sounds: /t, d, ʦ, s, z, n and rʲ/ are dental, that is pronounced with the tip of the tongue against the teeth rather than against the alveolar ridge. Russian has preserved an Indo-European synthetic-inflectional structure, although considerable leveling has taken place. The total number of words in Russian is difficult to reckon because of the ability to agglutinate and create manifold compounds, diminutives, etc. (see Word Formation under Russian grammar). Academic dictionary 1950–1965 120,480 full dictionary of the "Modern language"
(As a historical aside, Dahl was, in the second half of the nineteenth century, still insisting that the proper spelling of the adjective русский, which was at that time applied uniformly to all the Orthodox Eastern Slavic subjects of the Empire, as well as to its one official language, be spelled руский with one "s," in accordance with ancient tradition and what he termed the "spirit of the language." He was contradicted by the philologist Grot, who distinctly heard the s lengthened or doubled). The Russian language is replete with many hundreds of proverbs (пословица [pɐˈslo.vʲɪ.ʦə]) and sayings (поговоркa [pə.gɐˈvo.rkə]). These were already tabulated by the seventeenth century, and collected and studied in the nineteenth and twentieth, with the folk-tales being an especially fertile source. Judging by the historical records, by approximately 1000 C.E. the predominant ethnic group over much of modern European Russia, Ukraine, and Belarus was the Eastern branch of the Slavs, speaking a closely related group of dialects. The political unification of this region into Kievan Rus' in about 880, from which modern Russia, Ukraine and Belarus trace their origins, established Old East Slavic as a literary and commercial language. It was soon followed by the adoption of Christianity in 988 and the introduction of the South Slavic Old Church Slavonic as the liturgical and official language. Borrowings and calques from Byzantine Greek began to enter the Old East Slavic and spoken dialects at this time, which in their turn modified the Old Church Slavonic as well. Dialectal differentiation accelerated after the breakup of Kievan Rus' in approximately 1100. On the territories of modern Belarus and Ukraine emerged Ruthenian and in modern Russia medieval Russian. They became distinct in thirteenth century by the time of division of that land between the Grand Duchy of Lithuania on the west and independent Novgorod Feudal Republic plus small duchies which were vassals of the Tatars on the east. The official language in Moscow and Novgorod, and later, in the growing Moscow Rus', was Church Slavonic which evolved from Old Church Slavonic and remained the literary language until the Petrine age, when its usage shrank drastically to biblical and liturgical texts. Despite attempts at standardization, such as that of Meletius Smotrytsky c. 1620, the strong influence of the Church Slavonic until the close of the seventeenth century gradually gave way and the purity of the Russian language was strongly compromised by an incipient secular literature. The political reforms of Peter the Great were accompanied by a reform of the alphabet, and achieved their goal of secularization and Westernization. Blocks of specialized vocabulary were adopted from the languages of Western Europe. By 1800, a significant portion of the gentry spoke French, less often German, on an everyday basis. Many Russian novels of the nineteenth century, e.g., Leo Tolstoy's War and Peace, contain entire paragraphs and even pages in French with no translation provided, as his readers would not have needed it. The modern literary language is usually considered to date from the time of Alexander Pushkin in the first third of the nineteenth century. Pushkin revolutionized Russian literature by rejecting archaic grammar and vocabulary (so-called "высокий стиль"–"high style") in favor of grammar and vocabulary found in the spoken language of the time. Even modern readers of younger age may only experience slight difficulties understanding some words in Pushkin's texts, since only few words used by Pushkin became archaic or changed meaning. On the other hand, many expressions used by Russian writers of the early nineteenth century, in particular Pushkin, Mikhail Lermontov, Nikolai Gogol, Alexander Griboyedov, became proverbs or sayings which can be frequently found even in the modern Russian colloquial speech. ↑ Encyclopaedia Britannica, 1911 ed. . Retrieved June 18, 2008. ↑ Kazakhstan's News Bulletin, April 20, 2007. This page was last modified on 21 July 2015, at 15:34.